It’s the 1987 U.S. Open and Chris Evert is in the midst of an intense tennis match when her diamond bracelet snaps off her wrist. Her gorgeous jewelry piece is somewhere on the court, and she halts the game in order to find it. This is how the “tennis bracelet” got its name. 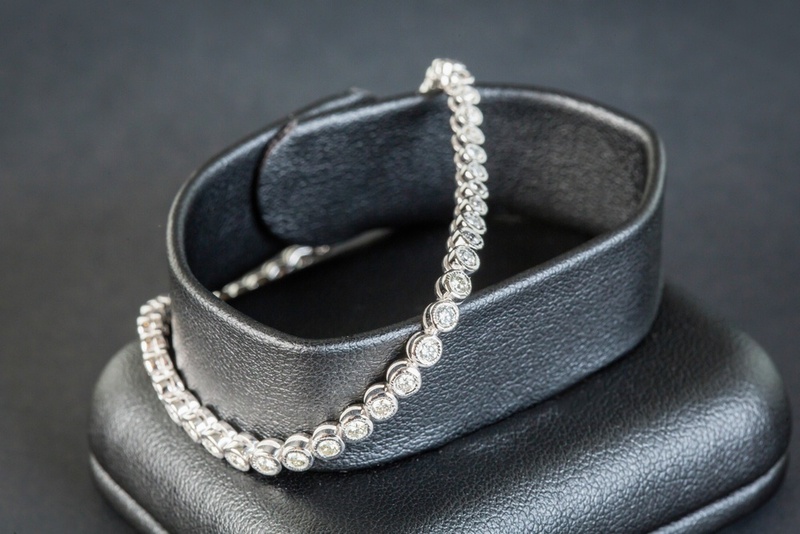 A typical tennis bracelet consists of diamonds of the same size, cut, color, and clarity set side by side continuously to make a complete circle. Flexible, durable, and comfortable, they are the go-to way to rock some bling in your everyday life. The nice thing about the tennis bracelet is that you can wear it for a night out on the town as well as for the everyday. Some women even wear them 24/7 because they are so comfortable. It’s ok to wear your bracelet that often, but do know that wearing it to sleep and in the shower can make it more prone to looking scratched and worn. Wear It With A Watch – This look has really grown in popularity. Just be sure that you pair your diamond bracelet with a nicer watch that matches your bracelet style. You don’t want some athletic, plastic, digital watch paired with your elegant diamonds. It just doesn’t look right. Wear It With Another Bracelet – Some people get nervous about doing this because they are worried the bracelets will scratch each other, however it looks wonderful. Try not to wear double bracelets every day, but it’s a great style for an evening out. Wear It On Its Own – The tennis bracelet is unbelievably flattering to the wrist and hand. There are a few key things to note when buying your bracelet. Mainly, you want to make sure the bracelet will be secure. This is especially true for tennis bracelets which many people wear every day. A bracelet that looks as if it will break or fall off is not worth it, even if it looks great! Safety Latch – Let’s face it, even though Chris Evert gave the tennis bracelet its name because hers fell off during a game, none of us actually want that to happen. We want the bracelet to be so secure that not even a zealous tennis match will send it flying. So, the safety latch is key. Most tennis bracelets that are truly secure have a clasp and a safety latch that snaps over the clasp. Aim to get both. 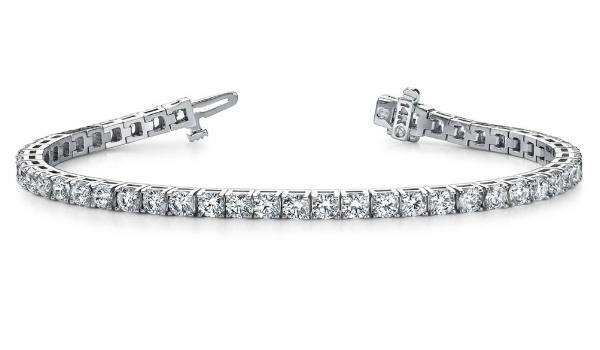 Diamond Tennis Bracelet with Box Catch and Hidden Safety Latch. Sturdy links – The links are what keep the diamonds in place and the bracelet from breaking apart. Flexibility – How does the bracelet move when it’s on your wrist? Do the links get caught awkwardly when they bend, or is the bracelet movement more fluid. A good test is to move your wrist around, maybe even dance with your hands in the air when you try the bracelet on. If the way it moves feels comfortable, then the bracelet is flexible. The flexibility means it probably won’t break. One of the sexiest qualities of the tennis bracelet is the loose, flirty fit. When your arm rests at your side, the bracelet should slip down to where your wrist meets your hand. At first, you might think this is too loose, but as long as it doesn’t run the risk of falling off your hand, it’s a perfect fit. If you’re still unsure whether or not the fit is right, see if you can slip a finger easily in the space between your wrist and the bracelet. If you can, the fit is right. You don’t want the bracelet too tight. Maybe to you that feels more secure, but it actually makes it more likely that the bracelet will give at the pressure and break off. The whole point of the tennis bracelet is being able to wear diamonds on a daily basis. It should be a piece that is so easy to wear, you can go hiking, go to the opera, go to the beach, and go to the gym without worrying about it at all. So go out and get yours, because you’ll love wearing this versatile bling.